Zdeno Chara had the last laugh. His shot with just under two minutes to play deflected off of Roman Hamrlik's stick and beat Braden Holtby for the game winner. It capped what many were expecting another low scoring affair. Both teams ignited their offenses and not even a raucous home crowd could push the Capitals to a home win as the Boston Bruins take game three by a score of 4-3 and a series lead as well. The Caps were using their speed well on the forecheck early in the game, eventually leading to a Bruin penalty. Alex Semin corralled a loose puck and fired it on net and it slipped past Tim Thomas for the series first power play goal. Things got a bit chippy though as the game wore on and the Referees seem to be playing the Bruins tune when Nick Backstrom and Milan Lucic were called for matching penalties at the end of the first period. That lead to a four on four and things opened up for both teams. Rich Peverly scored just :35 seconds into the second period to tie the game and Alex Ovechkin answered just :15 seconds later to restore the Caps lead. Ovi took a flip pass from Brooks Laich and he was able to break through the Bruins top defensive pair. As the puck was bouncing, he shot it past Thomas for his first goal of the series. Laich himself had quite a game, scoring his first of the series breaking down the right wing side with a beautiful feed from Backstrom. He out waited the aggressive Thomas and was able to beat him high after the Bruins goaltender went down. The Caps seem to have a handle on this game for most of the first half. 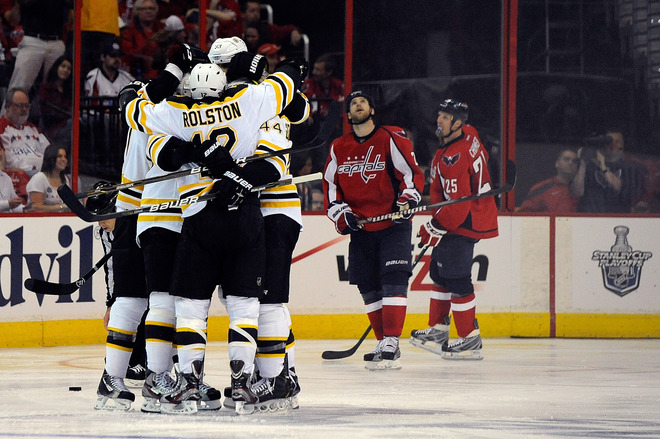 But they scrambled for much of the second half of the game and the Bruins took advantage. Holtby did not play poorly, a few of those shots he would have liked to have back, like Peverly's goal that hit his glove and helmet but still found it's way to the back of the net. The game winner off of Chara's shot was deflected past Holtby. Special teams finally played a role in this series. But it would be the four on four variety that made the difference for the Bruins. With the open ice, the Caps seemed to scramble too much. Two of the B's goals came from four on four situations. The Capitals still have the only power play goal of the series as their penalty killing is still hot. The Bruins have yet to score a goal on their power play (knock on wood). Part of the Bruins success comes mostly from turning this series into an emotional one. The Capitals seemed to do a good job of turning the other cheek, not letting the after whistle stuff get to them at TD Garden. But at the phone booth, in front of the red faithful, they seem to be caught up in the after whistle scrums and letting the Bruins get under their skin. Backstrom seemed to take his physical game too far when he took a cross checking penalty late in the game that lead to the four on four game winner by Chara. Then he hit Rich Peverley high with a cross check earning him a match penalty that comes with an automatic one-game suspension pending an official review from player safety. Although it did look like the Bruins embellished the first hit, Backstrom could be out for game four for his high cross check on Peverley. The Capitals need to get back to their bread and butter in this series, which is play a more patient game. They at times looked very sloppy on both ends of the ice and the extra curricular stuff after the whistles didn't really do them any favors. The Bruins are doing a better job of clogging up the front of the net, something the Caps did well in games one and two was to keep shots to the outside and let Holtby see them all. That didn't happen here and as a result, the Bruins take the series lead off of garbage goals and traffic shots. Caps lose the home ice advantage giving up one game at home. But with two days off between games three and four there is time for them to regroup and get back to what they need to get done. The Capitals were 47% in the face off dot, which is not helpful. Jeff Halpern, who has been a healthy scratch, could come in and help in that regard if Backstrom is indeed out for game four. Alex Ovechkin moved passed his head coach Dale Hunter to move into second for Capitals career playoff goals with his tally tonight. Even though they lost the game, Caps' centerman Brooks Laich earned the game's first star. It is Backstrom's first match penalty of his career, assessed at 20:00 of the third period.